(CNN) -- NFL quarterback Ben Roethlisberger, accused of sexually assaulting a woman last summer, said Thursday that he is innocent. 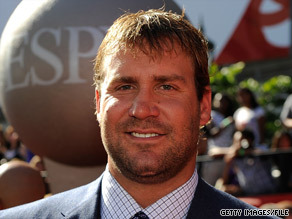 Pittsburgh Steelers quarterback Ben Roethlisberger says there is no merit to the accusation. "Saturday was the first that I learned of her accusations," the Pittsburgh Steeler said, calling the accusation reckless, false and an attack on his family. The woman filed a civil complaint against Roethlisberger last week. "I would never, ever force myself on a woman," he said. The complaint, filed Friday in the 2nd Judicial District Court in Washoe County, Nevada, alleges that Roethlisberger sexually assaulted the woman -- an executive casino host at Harrah's Lake Tahoe -- while he was staying at the resort for a celebrity golf tournament in July 2008. Teresa Duffy of the Douglas County, Nevada, Sheriff's Department, said the department does not intend to open an investigation unless the alleged victim comes forward and tells authorities she wants them to. Roethlisberger said that he would not discuss the "civil case in the media," but that he would fight to protect his family and his reputation. Harrah's itself is not named as a defendant. The woman said that the employees contributed to her emotional distress and that some defamed her and tried to cover up the incident. According to the complaint, on July 11, 2008, the woman was working on the 17th floor -- the same floor as Roethlisberger's room -- when Roethlisberger told her that his television and sound system were not working. He asked her to try to fix it, the complaint said. When she entered his room and deemed that the television was working, she tried to leave, but Roethlisberger blocked her way, the complaint states. He then, against her will, kissed her, groped her and sexually assaulted her, the complaint states. The woman says that in the months following the incident, she incurred emotional distress that resulted in hospitalizations that included treatment for anxiety and depression, the complaint said. Calvin Dunlap, the woman's attorney, said earlier this week that his client did not pursue criminal charges after the alleged assault because she felt discouraged when the resort's chief of security did not investigate the matter. According to the complaint, the chief told her she was "overreacting." Dunlap said the chief has "close ties to law enforcement." Of the eight employees, all but two are still employed by Harrah's, according to a spokeswoman for Harrah's Entertainment. Marybel Batjer of Harrah's declined to comment on the suit, other than to say that the alleged victim still works at Harrah's Lake Tahoe as an executive casino host. Another Harrah's Entertainment spokesman, Gary Thompson, said the company was "confident that a much different story will emerge and that the Harrah's employees will be dismissed from the lawsuit." Roethlisberger's attorney, David Cornwell, released a statement saying the charges were false. "The timing of a lawsuit and the absence of a criminal complaint and a criminal investigation are the most compelling evidence of the absence of any criminal conduct," he said.